Dermatology resident at the Centre Hospitalier de l’Université de Montréal in Quebec. Merkel cell carcinoma (MCC) is a rare yet highly aggressive tumour of the skin. While the dangers of other skin cancers like malignant melanoma are ingrained in most physicians’ minds—with the changing or atypical nevus often inciting an urgent biopsy—MCC remains an unfamiliar and neglected disease. Yet, the annual incidence of MCC is rising more quickly than that of melanoma, at 8% annually, and one-third of patients die within 3 years of diagnosis.1,2 Despite these sobering figures, a timely diagnosis followed by excision and radiotherapy can be curative in early disease. This article seeks to familiarize family physicians with both the characteristics and the management of MCC, so that they can quickly identify MCC patients and direct them to the appropriate specialists for care. 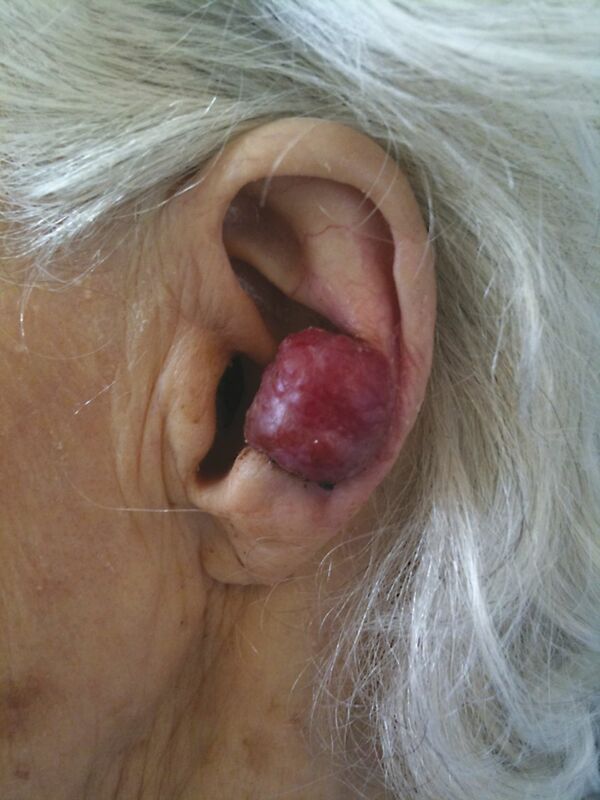 A 93-year-old white woman presented to the emergency department with an asymptomatic tumour on her left ear (Figure 1). She claimed that the lesion had appeared 2 months earlier and had been growing rapidly. The patient was otherwise healthy and not taking any medications. On physical examination, her skin showed moderate photodamage. A 5- by 4-cm erythematous, dome-shaped nodule was noted in her left conchal bowl. Findings from lymph node and abdominal palpation were normal. A 4-mm skin biopsy of the tumour was performed, and results confirmed a diagnosis of MCC. The patient refused further investigation but agreed to surgical debulking and radiotherapy of the left ear. She has since been lost to follow-up. While MCC remains an aggressive carcinoma, elevated mortality rates are also related to delays in diagnosis and treatment. Fortunately, increased recognition by primary care physicians and urgent referral for excision and radiotherapy will likely help improve disease prognosis in many patients. Merkel cell carcinoma (MCC) is a rare but highly aggressive cutaneous neoplasm with a rising incidence among elderly patients. The 3-year mortality rate is greater than 30%, surpassing that of malignant melanoma. The most common clinical features of MCC have been summarized by the acronym AEIOU: asymptomatic, expanding rapidly, immunosuppression, older than 50 years, and UV-exposed location. Definitive diagnosis of MCC requires a skin biopsy. Guidelines for the management of MCC recommended excision of the primary tumour whenever possible, with adjuvant radiation therapy to the excised tumour bed and draining lymph node basin to minimize locoregional recurrence. Le carcinome à cellules de Merkel (CCM) est un néoplasme cutané rare mais très agressif dont l’incidence augmente chez les patients plus âgés. Le taux de mortalité après 3 ans dépasse 30 %, soit un niveau supérieur à celui du mélanome malin. Les caractéristiques cliniques les plus fréquentes du CCM sont résumées par l’acronyme AEIOU: asymptomatique, expansion rapide, immunosuppression, audessus (O) de 50 ans et emplacement exposé aux rayons UV. Le diagnostic définitif du CCM exige une biopsie de la peau. Les lignes directrices pour la prise en charge d’un CCM recommandent l’excision de la tumeur primaire dans la mesure du possible, une radiothérapie adjuvante du siège tumoral et le drainage du bassin des ganglions lymphatiques pour minimiser la récurrence locorégionale.
. Merkel cell carcinoma: recent progress and current priorities on etiology, pathogenesis, and clinical management. J Clin Oncol 2009;27(24):4021-6.
. Merkel cell carcinoma. Ann Oncol 2010;21(Suppl 7):vii81-5.
. Merkel cell carcinoma. Arch Pathol Lab Med 2010;134(11):1711-6.
. Clinical characteristics of Merkel cell carcinoma at diagnosis in 195 patients: the AEIOU features. J Am Acad Dermatol 2008;58(3):375-81.
. Clonal integration of a polyomavirus in human Merkel cell carcinoma. Science 2008;319(5866):1096-100.
. Merkel cell polyomavirus DNA detection in lesional and nonlesional skin from patients with Merkel cell carcinoma or other skin diseases. Br J Dermatol 2010;162(1):59-63.
. NCCN clinical practice guidelines in oncology. Merkel cell carcinoma. Fort Washington, PA: National Comprehensive Cancer Network; 2010. Available from: www.nccn.org/professionals/physician_gls/pdf/mcc.pdf. Accessed 2010 Feb 22.
, editors. AJCC cancer staging manual. 7th ed. New York, NY: Springer-Verlag; 2010. Merkel cell carcinoma; p. 315-9.